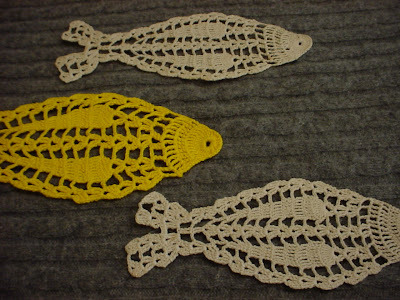 O.k., have you ever seen crocheted fish before? I've never seen anything like them, and I love them. Besides the stack of clothes, my Father-in-law's friend also gave me these and some other doilies that she crocheted. It's meticulous work, and I love the fish because they echo my sentiments on doilies. Doilies are useless. Pretty, but useless. Thus, fish doilies are perfect - could you possibly use them as anything? Nope! What to do with these fab crocheted fish? Why, starch them and make them into a mobile, of course!!! Whee! !